We were having dinner outside on the back patio tonight when we heard a small 'thump'. Something fluttered to the ground behind us and I jumped up to take a look. The dogs jumped up too, so seeing it was a small bird I instantly scooped it up in my hands before they got a chance to investigate further. It was the most delicate little thing I have ever seen. 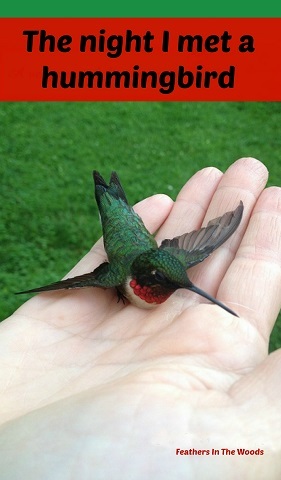 A Ruby-Throated Hummingbird had flown into one of the picture windows and fallen to the patio below. It's body was no longer then my pinky finger and it was the most vibrant living creature I have ever seen. Clearly dazed, it didn't fight as I held it...it just sort of perched there on my hand. At first it sat with it's wings outstretched. After about a minute, it folded it's wings in and still just sat there with it's eyes closed. I couldn't believe how beautiful it was! The red and green iridescent feathers glistened in the sun. That tiny bill was thinner then a toothpick. It's wing feathers were almost sheer when it's wings were opened. I moved over to the rock garden where it was quieter and just sat there with it on my hand. I sat there for several minutes as he slowly came around. First his delicate little feet started to grip my hand. Then his eyes opened slowly, but still he just sat. I wasn't sure how aware he was to me holding him, or how scared of me he would normally be. Since he seemed to be balancing fine I decided to move him to the perch on the hummingbird feeder. I lifted him all the way up to the perch and nudged his feet with it. He stepped onto it and I simply backed away. He sat there for another minute and hubby got up to look at him. I asked "do you think he's going to be ok?" Hubby was just replying that 'no, he's probably not gonna make it', when the little guy zoomed away from the feeder into the trees! Seconds later he zoomed back and landed back on the perch and got a drink of the hummingbird nectar then zoomed back off. We didn't see him after that and I hope that he makes it. He probably has a huge headache today from his impact with the window. Thankfully his bill or wings didn't seem broke. I love watching the hummingbirds at the feeder and even make them fresh nectar every week, but have never had the opportunity to study one close up for so long. What a fabulous experience and just one more reason I love living here in the middle of nowhere! What a fantastic photo! I too hope the poor thing is ok. Thanks, you don't often get a photo op that like that...I had to take full advantage! Thanks for stopping by! Going to check out your photos now...thanks for sharing them with me! Wow! What a cool experience, except for the poor little guy's mishap! I'd say since he was able to fly, he's good. :) Awesome photo op! He rested for quite awhile but seemed ok as he flew around afterwards. Ever since this happened I have seen a hummingbird just sitting on the top of the crook that holds the feeder from time to time. He sits there for a few minutes then drinks and fly's off....I'm sure it could be another one, but what an odd coincidence. Sweet little birdie! We have them here in Dallas, even though we're right in the city! I have always been amazed at how tame they seem and how they will still come to the feeder if I sit quietly in the chair close by. I bet your little guy can tell that you care for him :) Thanks so much for sharing this sweet story at the Creative HomeAcre Hop! Love love love your blog, Lisa. Hummingbirds amaze me! They migrate for thousands of miles every year....what a huge trip for a tiny bird! Thanks so much...Love your hop and I'll be back next week!